Aikenhead's PharmaChoice was founded in 1938, by Bill Aikenhead, and has served Renfrew and Area with unparalleled service for over 70 years. Aikenhead's Drug Store has an outstanding working relationship with the staff at The Bonnechere Manor. In response to the expanded scope of practise of pharmacists, Aikenhead's is hard at work making our space work for you! April 5th was Sweater Day in Downtown Renfrew in honour of the Stanley Cup. 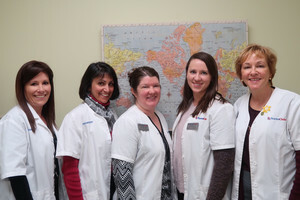 Aikenhead's Pharmacists are ready to serve you!